As I reported here, Go Hillsborough and Hillsborough County intentionally refused to provide timely information I requested regarding how our tax dollars were being spent. They refused to release information about focus groups they conducted last year to create the Go Hillsborough campaign. They did not want the public to know what they were doing with our taxpayer dollars. Because they were busy manipulating the process by selectively micro-targeting voters more likely to oppose a sales tax hike to figure out the right campaign "message" to flip them. So much for the "good faith" community outreach by a "transportation expert" to create a transportation plan. At the October 21, 2014 Policy Leadership Group meeting, Parsons Brinckerhoff told us they would use this 4 phase process of understanding needs, exploring options, making choices and finding consensus to create a transportation plan. The discussion of funding was to be at the end. Instead, Parsons immediately turned "their" process over to the politically well connected PR lobbyist Beth Leytham. She went directly to funding and a sales tax FIRST by micro-targeting focus groups at the beginning of last November. She specifically targeted voters most likely to oppose a sales tax. Leytham conducted these focus groups at the same time she was rail cheerleader Mayor Buckhorn's campaign PR consultant and as Buckhorn sat on the Policy Leadership Group. We already knew Buckhorn wanted a huge sales tax hike. Another boatload of money he would get could bail out his streetcar and help him build rail from the airport to Westshore to downtown. Leytham is also closely associated with County Commissioner Ken Hagan. As we posted here, Hagan jumped out early months before the proposal was announced June 11th supporting a tax increase. How coincidental is it that Hagan comes out for another huge tax increase right after Leytham conducted her poll in April? Leytham's role was to get that tax passed and she is receiving $300K of our tax dollars to do it. Leytham used the same pollster, Frederick Polls of Arlington, VA that she used for Buckhorn's campaign, to conduct Go Hillsborough polling and focus groups. Frederick Polls called the poll he conducted for Go Hillsborough "Hillsborough Co (FLA) transportation sales tax". How much clearer can it be that Go Hillsborough was orchestrated for another sales tax hike? The poll was named transportation sales tax. The County practically told us that themselves last September when they handed crony Parsons Brinckerhoff a million dollar taxpayer funded no bid blank check for work titled, "Hillsborough County Transportation Referendum Support". 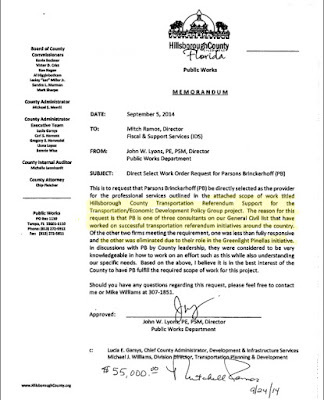 "Hillsborough County Transportation Referendum Support"
The Leytham focus group information I finally received last week, 3 months after I began requesting it can be found in a folder titled "GoHillsborough Focus Groups". Please check out the Screener.doc files and the Focus Group Final Report. This information confirms Leytham's focus groups was a micro-targeting effort. The first activity this so-called public engagement process did was micro-target specific voters. Leytham's focus groups totally eliminated millennials. Why? Perhaps because Leytham already knew they had them or they did not vote in sufficient numbers to affect an outcome. Those who lived in the city of Tampa urban core were not targeted. Why? Because the rail tax in 2010 got most of its support in the city of Tampa, specifically along the rail lines. Leytham specifically targeted voters in the parts of the county that rejected the 2010 rail referendum. She focused on conservative Republicans who were likely to oppose a sales tax increase. Moderate or liberal Republicans were ignored. She conducted no focus groups that specifically targeted any Democrats. It is obvious that Leytham's micro-targeting voters was to find out what type of "messaging" campaign was needed to flip those voters most likely to oppose a sales tax hike. The County/Leytham/Parsons knew they needed these voters support for another 30 year sales tax referendum to pass. Many change their minds and move to supporting (or at least considering) a one-cent sales tax increase when confronted with a stark choice -- vote NO and learn to live with an ever-deteriorating/worsening traffic experience or vote YES for a well-conceived plan that works to make things better. Tax Time Limit. As might be expected, the concept of a limit or sunset on any sales tax increase is more popular than no-limit. However, from the group discussions, it is not clear how much additional “YES vote” support such a limit would ultimately generate. Most want a very short -- 5 year or even 10 year -- limit. Others refer to the C.I.T. and the stadium deal as their proof such promises are not kept (emphasis mine). This likely means successful messaging has to be more directed toward INDIVIDUAL BENEFIT (“what’s in it for me?”) rather than COMMUNITY BENEFIT (how an upgraded modern transportation system makes Hillsborough stronger and better). Leytham targeted these voters with doom and gloom, either or scenarios to deceptively make "their" case that another huge sales tax increase is the only option for funding our transportation. Again at the June 11, 2014 Policy Leadership Group meeting, the process went backwards. Merrill/Parsons/Go Hillsborough's proposal focused on funding not a transportation plan. They proposed another huge 30 year $3.5 Billion sales tax increase as the ONLY option to fund our roads and transportation but no details for what was to be funded. Go Hillsborough had to propose the tax before they had a transportation plan. Sound eerily familiar? The Eye has posted tirelessly about the cronyism associated with the Go Hillsborough campaign. The County went around any transparent process to hand Parsons the work knowing they would select crony PR lobbyist Leytham to run the campaign. Proponents of a transportation-tax referendum must be careful not to present “a solution in search of a problem.” Whatever plan is presented to voters, it must work within existing experiences and offer a “better” transportation experience. Otherwise, voters in Hillsborough are poised to reject a sales tax increase just as Pinellas voters recently did. Go Hillsborough campaign is no different than the taxpayer funded Greenlight Pinellas campaign conducted by the ethically challenged PSTA. Go Hillsborough could be worse. The County has tried to hide behind the consultant Parsons Brinckerhoff and Parsons' crony PR sidekick to cover up what our tax dollars were being used for. The County consistently gave excuses they did not know or did not have information about what Go Hillsborough was spending our tax dollars on. Cover ups are worse than the actual "dirty deeds". What is astonishing is that both the focus groups and polling details confirm there is no desire for another huge 30 year CIT-like sales tax increase. Yet that is the only proposal Go Hillsborough presented because that decision had already been made orchestrated long ago. Our county commissioners should have had all this information if they are making BILLION dollar decisions. Why didn't they? Why did Parsons deceive the county commissioners by only giving them selected filtered information? Will anyone in the media ask these questions? Micro-targeting voters is a campaign strategy not a process to create a fiscally responsible transportation plan. Engineers do not micro-target focus groups to create campaigns to flip them, crony PR lobbyists do. Electioneering is using tax dollars against the taxpayer. Isn't using our tax dollars to micro-target voters to create a campaign pushing another 30 year sales tax hike considered a form of electioneering? Electioneering is illegal and certainly unethical. The legal bar may be much lower than the ethical bar but the county should be hurdling the ethical bar when using our tax dollars. Go Hillsborough is an orchestrated crony phony baloney PR and marketing campaign. It has been tainted from the start and is on the way to becoming toxic. A bad, corrupted process creates a bad, corrupted product. If we cannot trust the County when they are trying to get our money, why should anyone trust them when they have more of our money? Not one more taxpayer dime should go to Parsons Brinckerhoff, Beth Leytham or anyone else associated with Go Hillsborough. Our county commissioners are ultimately responsible for oversight. Demand our county commissioners shut down Go Hillsborough now!